Although I had technical difficulties with this recipe, I’m glad I stuck it out, they were delicious! This week I was debating what to post for my What’s For Dinner Wednesday recipe when I came across a new one. 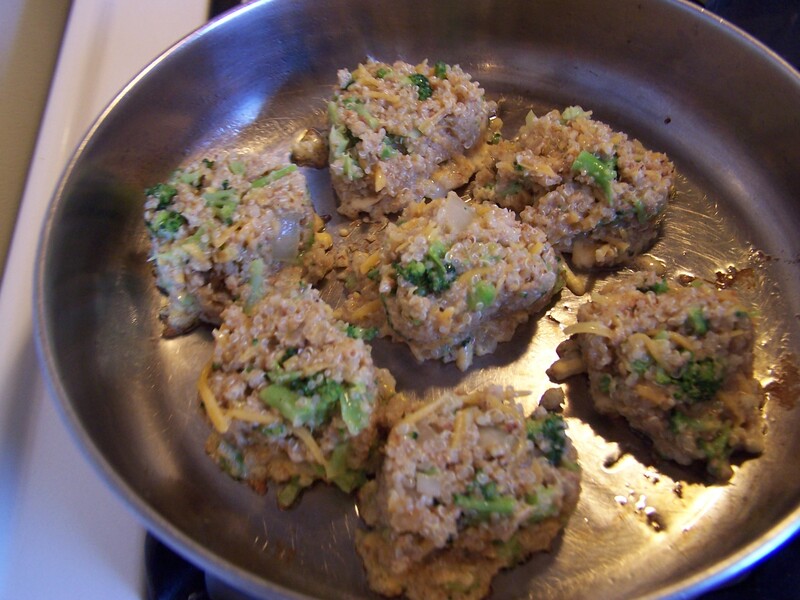 I was scrolling through Facebook when I saw a post on Shop Girl for these Cheesy Quinoa and Broccoli Patties. As always, I looked to see if I had all of the ingredients and I did. I had just cooked up a batch of quinoa the night before, so that was already done, and I had everything else for them. In the past we have made Zucchini Fritters and even Potato Latkes, and we love them all. I thought this might be similar and I thought my chance for everyone liking them was pretty good too. The ingredients for this recipe came together very quickly. I threw the ingredients together pretty quickly, cooking up the onion, and chopping the broccoli. 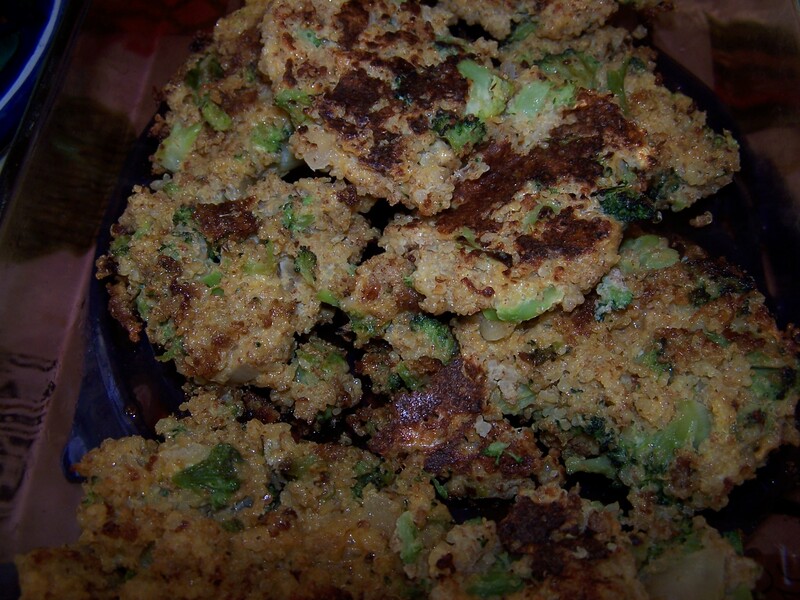 I used wheat bread crumbs, egg substitute and nonfat cheddar cheese in order to keep within our dietary restrictions. However, when it came time for cooking my patties, I ran into trouble. It wasn’t trouble from the recipe, it was my pan that was not cooperating. It’s not the best pan and on occasion, things will stick. Today was one of those occasions. Each time my patties would get nice and crisp, when I went to turn it over, the layer of crispiness would stay stuck to the pan. I was tempted to abandon the whole thing, but these really did look and smell good. I didn’t want to let it go. I gave it some thought, and then decided to remove them from the frying pan and olive oil and place them into the oven at 350 degrees and bake them to finish them off. That worked out great. However, I still had a batch that hadn’t gone into the pan yet. By now Don had come home, and to my rescue. When I showed him the leftover batter, enough for about five more patties and too much to throw away, he opted to try using our counter top griddle and grill them. Again, it worked out great. Next time, this would be my method of choice to cook them. I’m glad we kept to it. The recipe was a hit with four out of five of us and there was not even one left over. Don even tried dipping them in Sweet and Sour dipping sauce, which was a great addition. That’s a thumbs up, if I ever heard one. I encourage you to visit Shop Girl’s blog to see the original post so that you can see what *her* patties looked like, since she didn’t have the technical difficulties I had. Her photos are great and the recipe is a good one. For my family, I doubled it, so we had 12 patties, not six. Additionally, my quinoa was already cooked and cooled, this recipe talks you through cooking it first, and letting it cool. 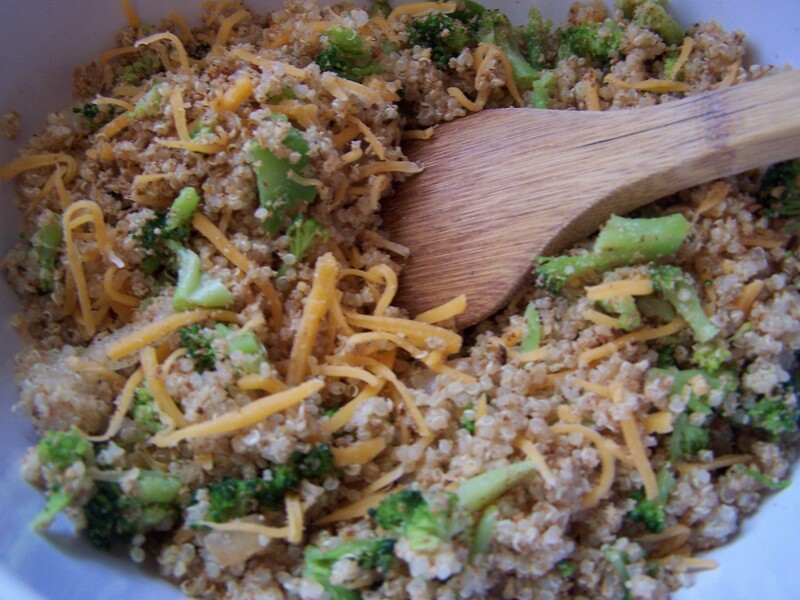 Be sure to rinse your quinoa well before cooking it. Seemed like all was well when I started out, but my pan did not cooperate with me this evening!